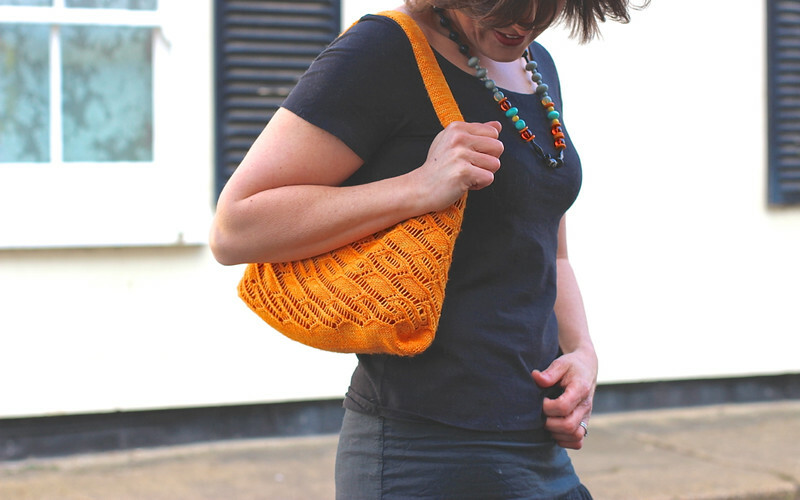 Last year I resolved to "design something lovely" during Knitting & Crochet Blog Week. As it turns out I didn't design the pretty little something I had in mind at the time. Other projects got in the way, summery weather turned cooler and the days grew shorter ... and I dreamed up something else instead. My Skeppe hat. I've knitted smocked stitches before, but only the variety where you wind yarn around and around stitches held on a cable needle. The thing that appealed to me about this stitch was how simple it was. No extra needle. No winding. 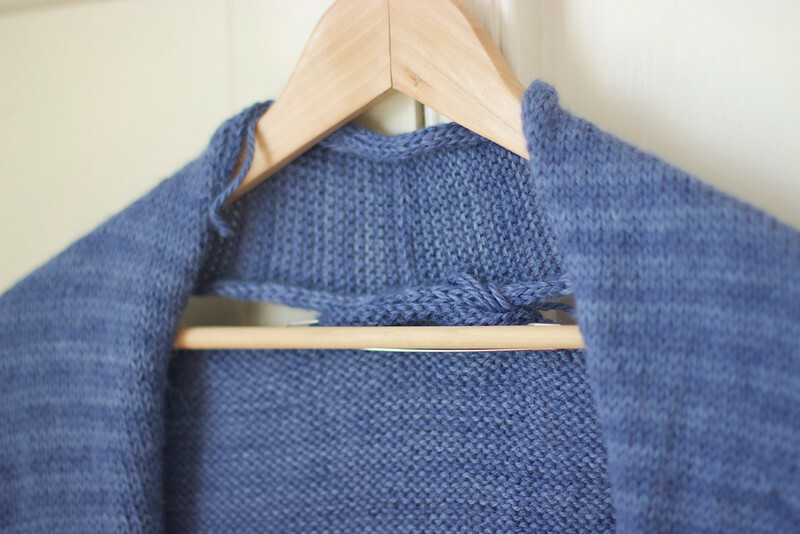 I thought it would be perfect for a quick, easy and very satisfying knit, and a great way for newer knitters to stretch their skills. I started with a prototype for the smallest head in our house and then set about making it work for a heavier yarn. I had fallen in love with the marshmallowy feel and beautiful, earthy colour range of Quince & Co. yarn after knitting a hat for my sister-in-law in Osprey. So, I bought some more, this time in a worsted weight; Lark. The brown is the "Twig" colourway and the yellow, "Carrie's Yellow". Aren't they gorgeous? The next step was to grade it for different sizes and improve the brim. That actually took a bunch of maths and lots of swatching to get the look I was after. Because the stitch pattern is over a fixed number of stitches I had to fiddle quite a bit to get the ribbing to flow into the body of the hat perfectly. The final step was working out how to make a tassel with a twisted cord, and then how best to explain it to everyone else! Quite a few tassels were made in the process and I just love how they have turned out. So, I've done it ... designed something ... just not quite the thing I first thought I would! And, after nervously sitting on it for months ... 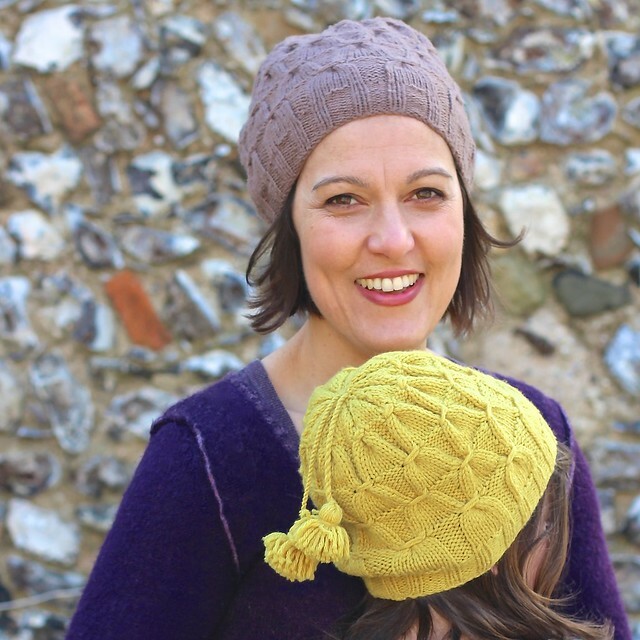 I've finally had my pattern edited and now test knitted by a bunch of fabulous knitters (thank you!!!). 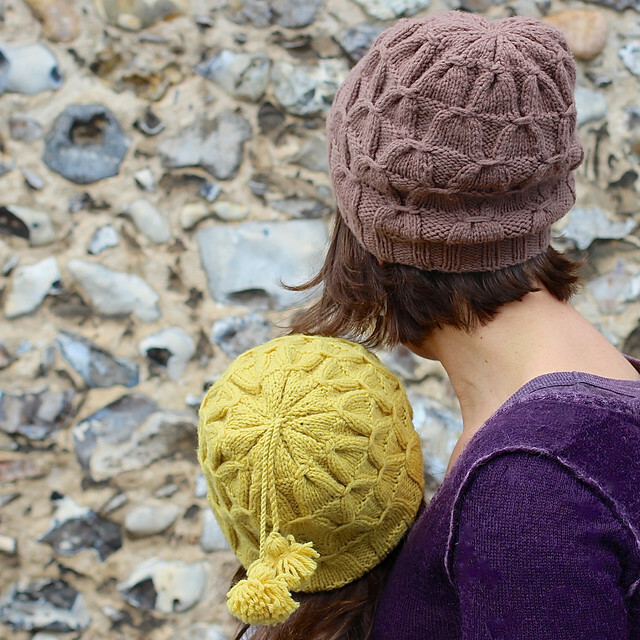 I'm pretty close to finalising the pattern now, and pretty soon - it'll be properly published! I can't wait, but I am so nervous it's crazy. P.S. Have you remembered to enter my giveaway?! I'm announcing a winner tomorrow! Sometimes ideas that seem fabulous in your head, aren't that great in "real life". I'm making slippers for Outfit 4 and I thought I'd like to have a crack at making the buttons for them. Linen and embroidery felt like a good idea. I had visions of beautiful, delicate, stunningly complicated, extraordinary patterns, swirling on my beautiful buttons ... yeah, I know. So, although my kids think it's cute, my bird button is embarrassingly twee, and I don't think I'm going to use it on my slippers! But, I'll tell you how I made it anyway. 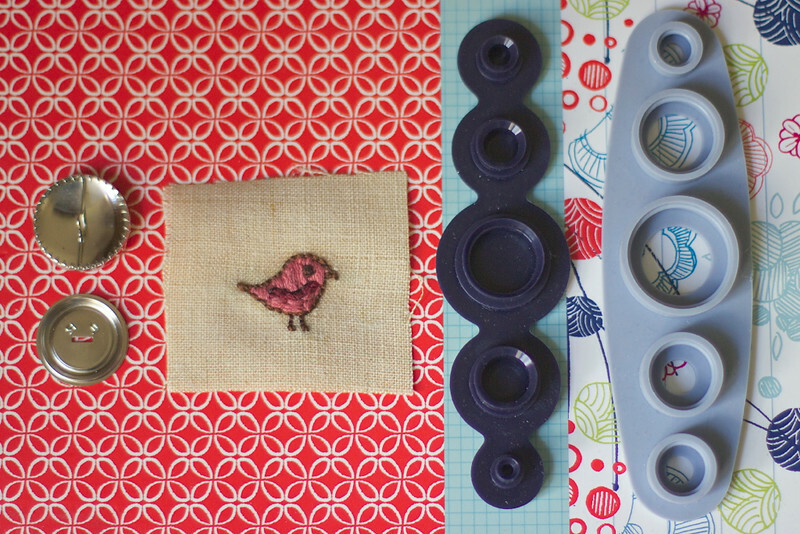 I haven't made covered buttons before. I think once upon a time lots of folding under and cursing may have accompanied the making of covered buttons. 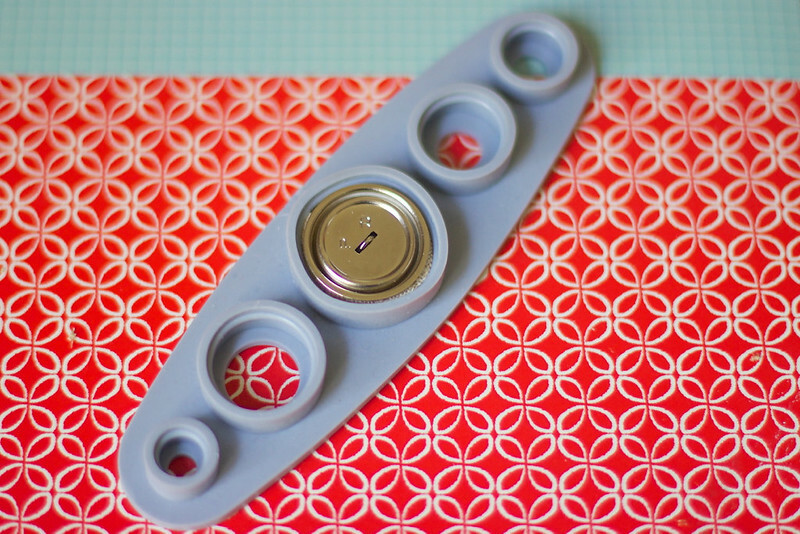 Or, did people cover up old buttons with fabric? ... These days there is a special contraption which makes covered buttons a total breeze. 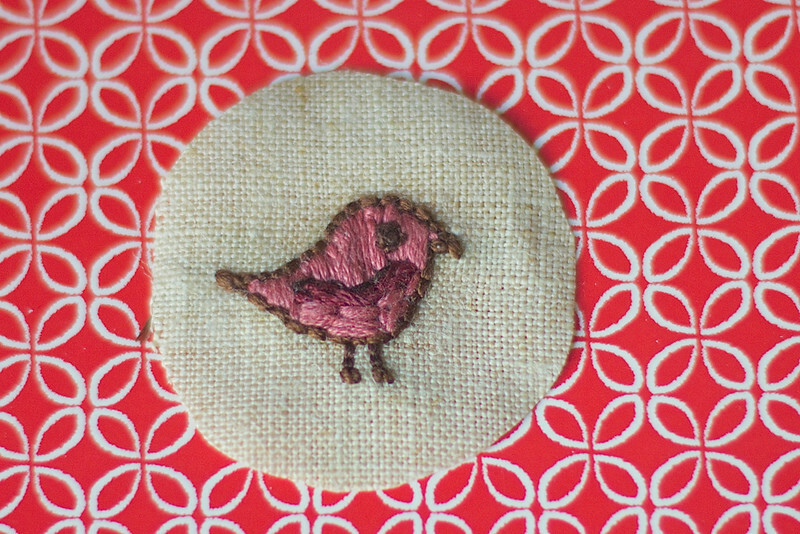 After I drew a little bird shape on the linen with a special pen that vanishes upon contact with water, I stitched a running stitch border, lots of little stitches to fill it in, a sort of chain stitch for a wing and a french knot for an eye. 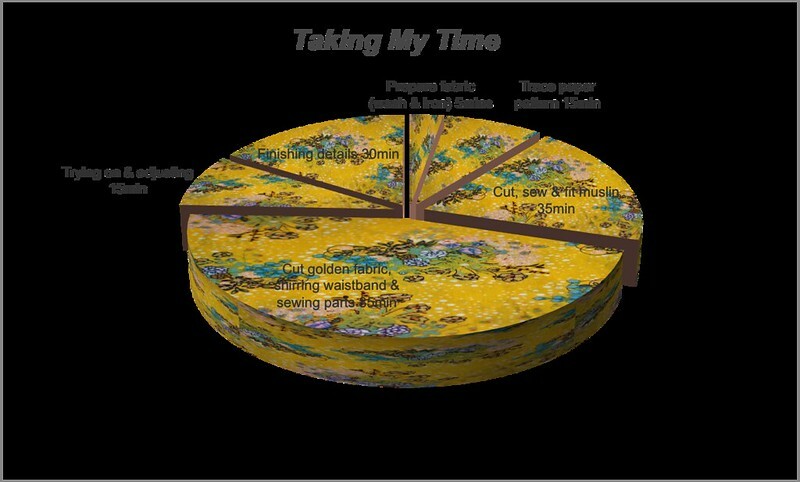 The next step was to cut the linen into a circle. It was then that the real fun began. The little bird was tucked face down into the appropriate hole in the rubbery base (mine was for a 29mm button) and the smooth button upper wedged in on top. I folded the excess fabric in towards the centre of the button and inserted the button back over the raised shank so that the letters on the back faced the right way. 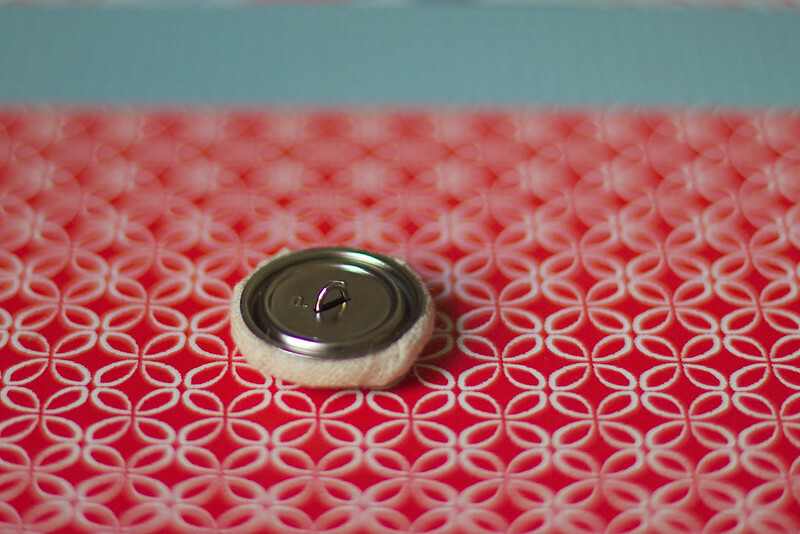 Next I placed the hard set of circles over the button bottom and pressed firmly. The little fingers in my photo belong to my 3 year old helper. She was a very good finger model but wasn't strong enough to actually do much pressing. So, I pressed firmly, listened for a little click noise as the button fixed together and then "popped" it out of the rubbery base. Bingo. Button. And, from the front. 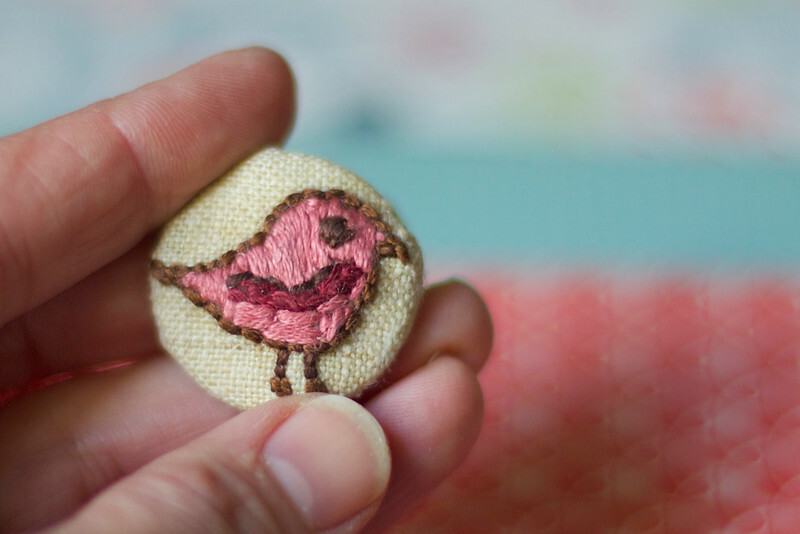 One funny little birdy button with a very uncertain fate. If you haven't already - feel free to enter my giveaway! 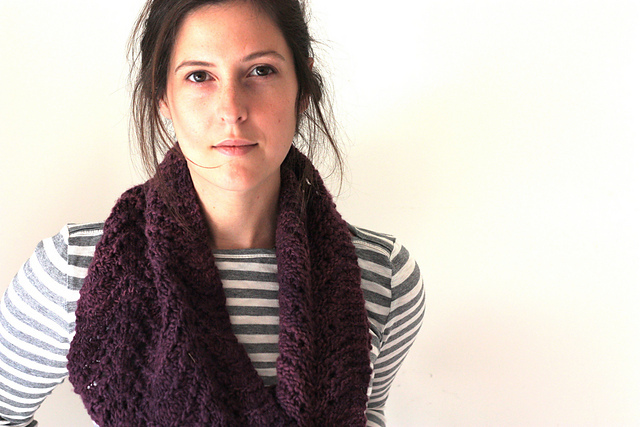 Amy lives in Vermont, the home of perfect knitwear weather. She's had a bunch of fantastic patterns published in a variety of magazines and also self-publishes under the label Savory Knitting. I've made no secret of how much I love Amy's patterns. Amongst other things, she designs lots of beautiful cardigans, a garment very close to my heart :) I tried one of her bag patterns for Outfit 3 and I have to confess to stashing another few of her patterns away too ... You saw the cardigan for Outfit 4 yesterday - yip, more Amy Christoffers. Addicted. Tell us a little bit about yourself and how you got to be a designer? I learned to knit in college, from a book. I was in art school at the time and I think knitting appealed to me because it was grounding, creative but more solid than “Art” so I did it more and more until it took over my whole creative life. For a long time I knit from patterns in magazines but I’m rather tall and had a lot of trouble finding patterns that worked for me and that reflected the way I wanted to dress. I inevitably ended up having to re-write every pattern to fit me or to work with the yarn that I had found that was never the right gauge… So I just started designing and writing my own patterns. Then the knitting boom started and suddenly there were ‘indy designers’ and all these new influences. I was too chicken to submit for a L-O-N-G time but one day I just decided to commit, and see how far I could go with it. That was about 3 years ago! I am amazed every day that people like and knit my patterns. It gives me so much joy, it's indescribable. 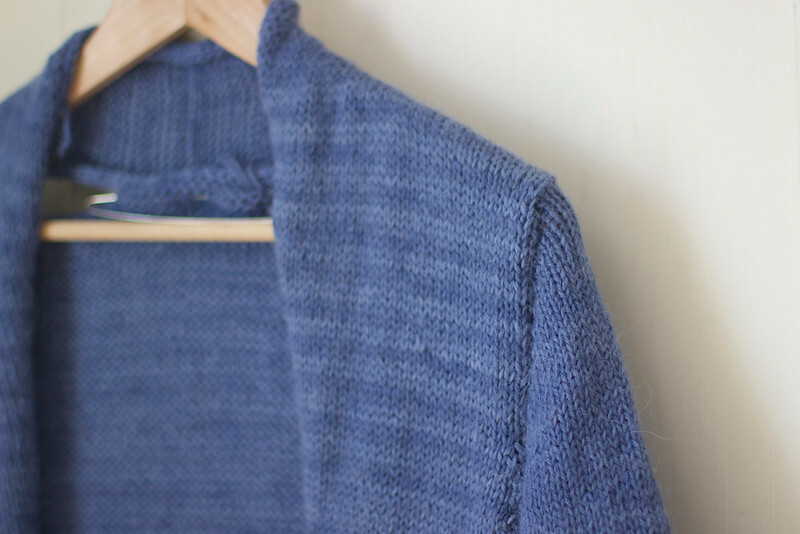 You design lots of (very fabulous) cardigans - are they your favourite thing to design? And wear? I love love love cardigans. So easy to wear, so much design potential. 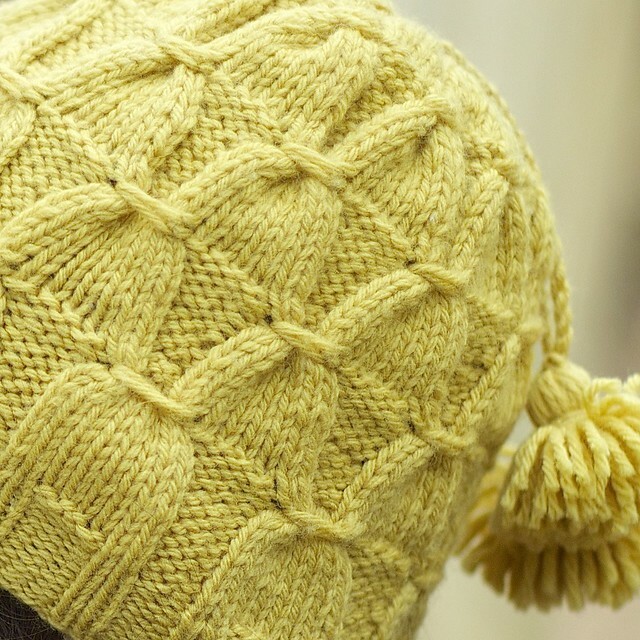 I think if you’re going to spend hours and hours knitting on something you want to get the most out of it and cardigans are perfect for that… But hats are my favorite thing to knit, to design and to wear. 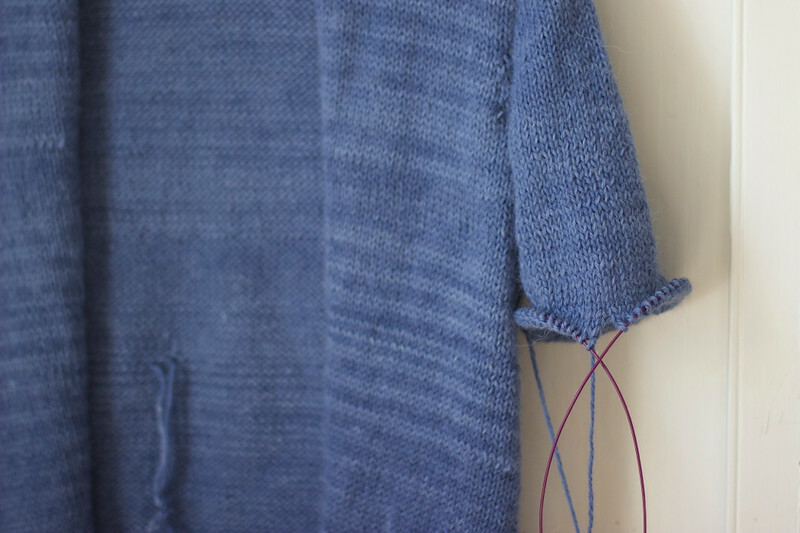 Lots of your patterns include set in sleeves - what’s your favourite method of construction? Set in sleeves are great because I think they hold up to wear better over time. Bottom up raglan is a close second. Everywhere! In anything! Books, movies, fashion magazines, a hike in the mountains… Mostly its just what I want to wear but sometimes a design starts with a “I wonder what happens if I…” or something like that. A little birdy has told me there’s a book on the horizon… are you allowed to talk about it? Thank you so much Amy! I for one can't wait to get my hands on that book. 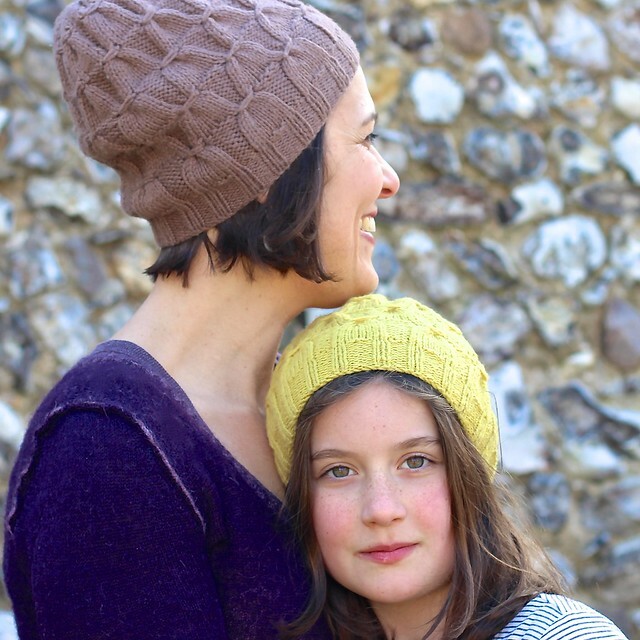 If you want to see more of Amy's patterns you can find her on Ravelry and on her website Savory Knitting. If, like me, you covet every one of her patterns - you might like to join the Savory Knitting Addicts Ravelry group. You'll feel right at home amongst the other addicted Savory Knitters. P.S. Have you remembered to enter my giveaway?! Colour. I have to confess to usually grabbing the boldest, brightest, most gloriously rich colours first. I can't help it. They are irresistible. Striking, deep jewel tones sing beautiful songs and before I know it, they're leaping into my basket and coming home with me. My Stash is overflowing with shiny jewels. In the meantime, I'm wallowing in the vivid blue yarn that I dyed myself for Outfit 4. The scrummy blue tones (look at those stripes! I told you my batches weren't exactly the same!) are soothing and relaxing. I haven't knitted so much blue for myself for ages and I'm loving it. 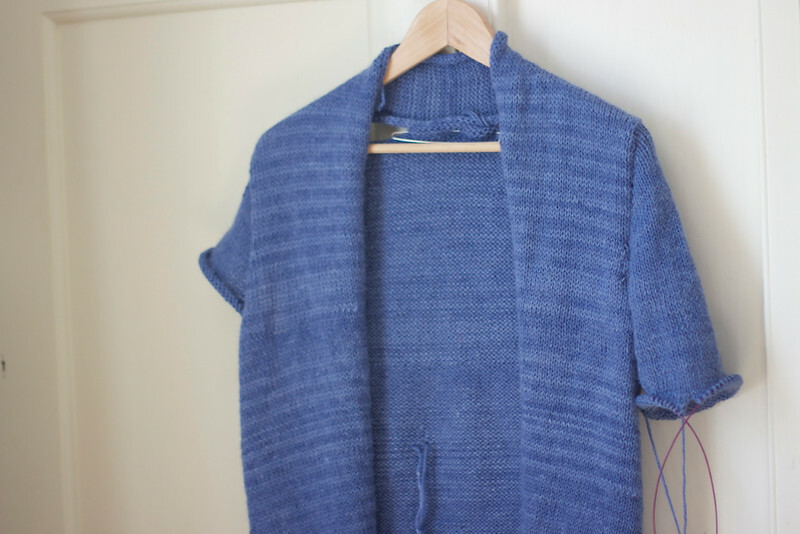 I'm knitting Amy Christoffer's Bailey cardigan for Outfit 4. It's generously sized with simple lines, perfect for lounging about which is exactly what I plan to do in it. However, I have fiddled with the pattern a bit, to make it work better for my shape. Most knitting patterns are written with standard sizes in mind and I, like most people, am not a standard size. My bust, waist and hips actually fall into three different sizes, and when I choose a cardigan that fits my bust, it's invariably far too big for my narrow hips. In the case of this cardy, it was going to be a whopping 5 1/2 inches bigger than my hips. A bit more ease than I was after. So, before casting on the first stitch, I pulled out the calculator and rewrote the instructions to suit me. First, I worked out how many stitches to cast on in order to achieve 3" of ease around the hips. Then, I calculated that I'd need to decrease 2 stitches on either side, every 4", four times as I knit up the body, in order to reduce the hip width to that needed at the bust. I also decided to lengthen the body by a few inches to make it extra cosy and took that into account in my calculations too. The next thing I've done is re-interpret the pattern at the top, for the fronts and back. My row gauge doesn't match that required by the pattern so knitting for X rows was unlikely to work out well. It'd end up too long. Instead, I worked out how many inches X rows was using the pattern's required row gauge and simply knitted to that many inches. So far it seems to be going okay. I like the fit, I absolutely love the icord bind off all the way around the front and neck edges, and the whole thing is soft and cosy. I'm hoping that in a few days it'll be blocking. P.S. Have you entered my Giveaway?! Okay, so I know it's Knitting & Crochet Blog Week, and this is sewing ... but, I have to finish Outfit 4 & tell you about it, and I just made some PJ bottoms ... and anyway, they're pretty don't you think? Any self-respecting loungewear outfit needs lovely lounge pants and I'm pretty chuffed with these golden lovelies. 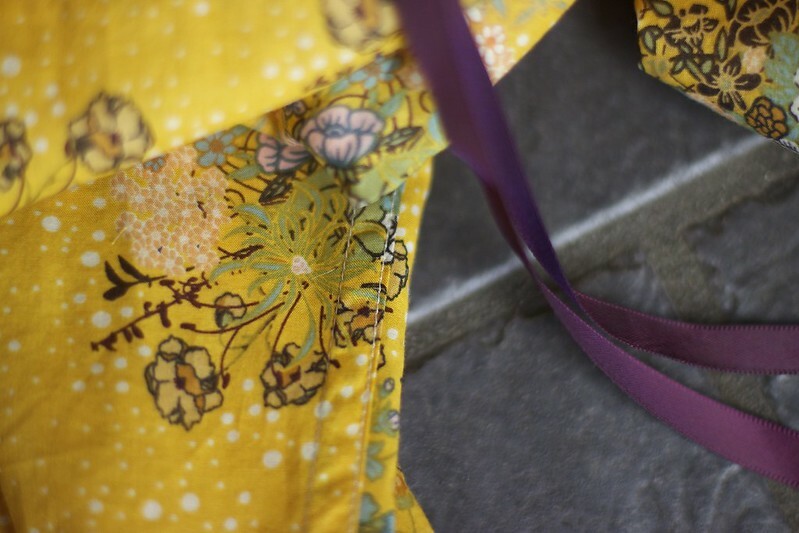 I fell head over heels for this beautiful cotton voile as soon as I saw it. 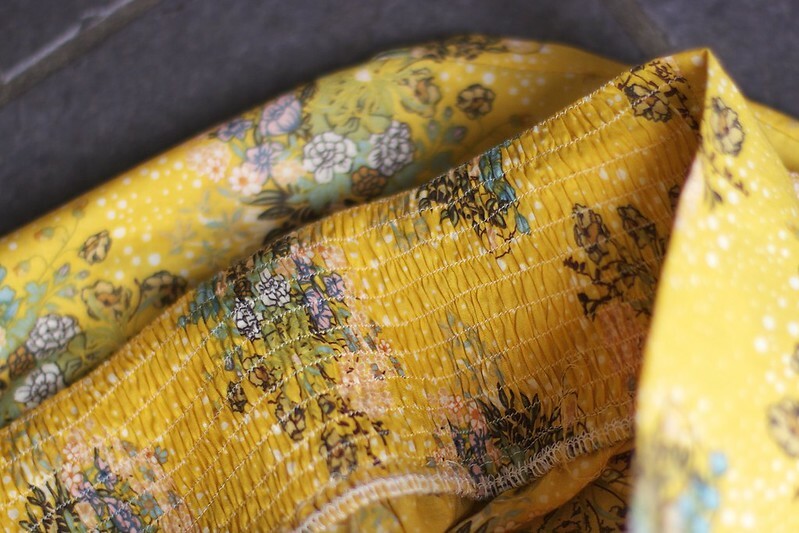 It's silky-soft and drapey and the sunflower yellow and delicate sprigs are super cheerful, yet distinctly vintage. 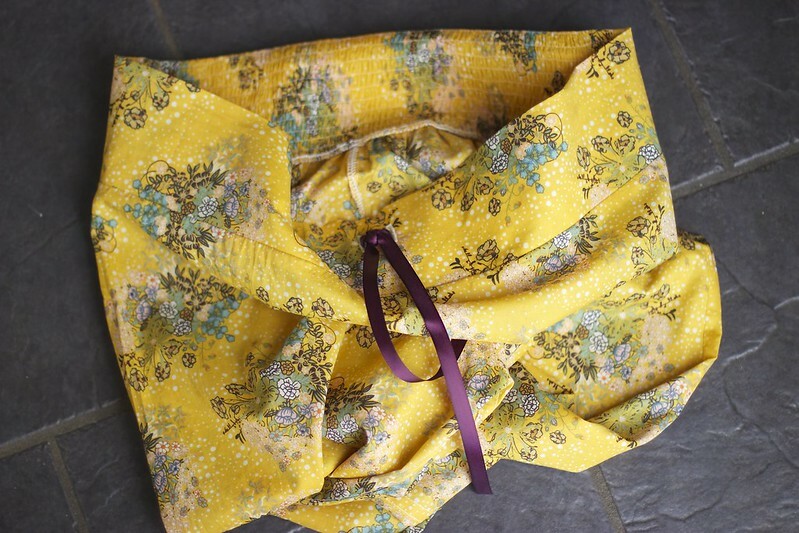 I wanted a pattern that'd add a little something special to my PJ's, and Noodlehead's free Shirred Voile Pajama Pants tutorial fitted the bill perfectly. I started by tracing around a pair of old PJ bottoms and making a basic pattern of each leg onto baking paper. I then used that paper pattern to make a muslin from some of my lime green "practice" fabric. A quick try on and a few pins later, and I had a better fitting pattern to use for my lovely voile. The gathering across the back of the pants was the main reason I chose this pattern. Isn't it cool? It feels good too. Wide elastic is encased between rows and rows of shirring and it creates a very comfy fit across the lower back. 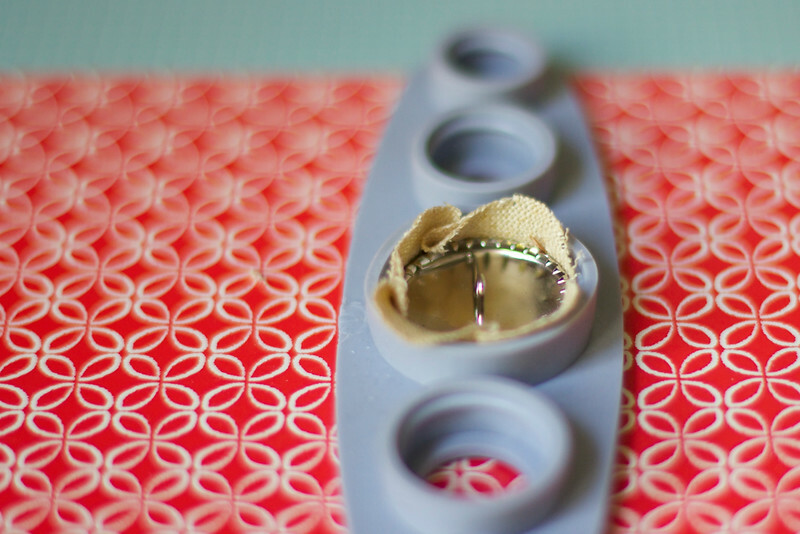 Have you sewed shirring? It's awfully fun. I had a bit of practice making my Washi dress for Outfit 1. At first it doesn't seem like the rows are going to gather, then a few rows in .... whooooosh, and the whole thing scrunches up. 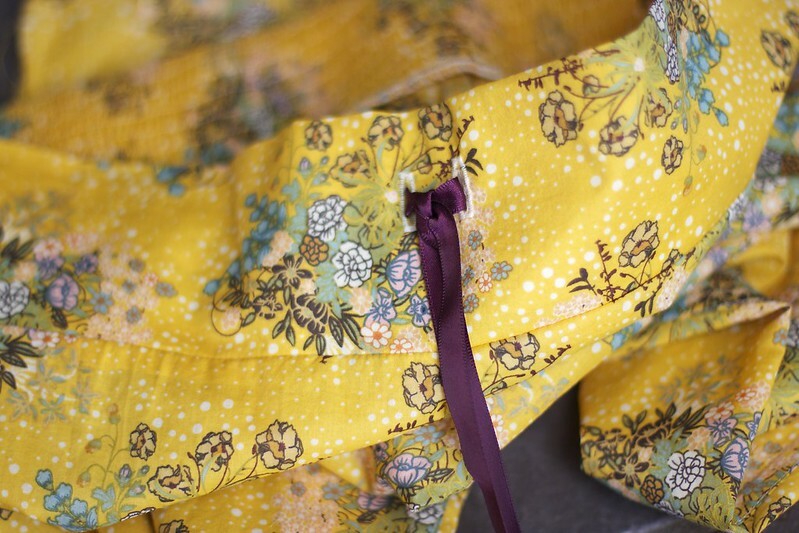 The trick is to wind your elastic onto your bobbin by hand, without stretching it out as you go and, to leave long tails at the beginning and the end of your rows so that the elastic doesn't ping back into the seam. 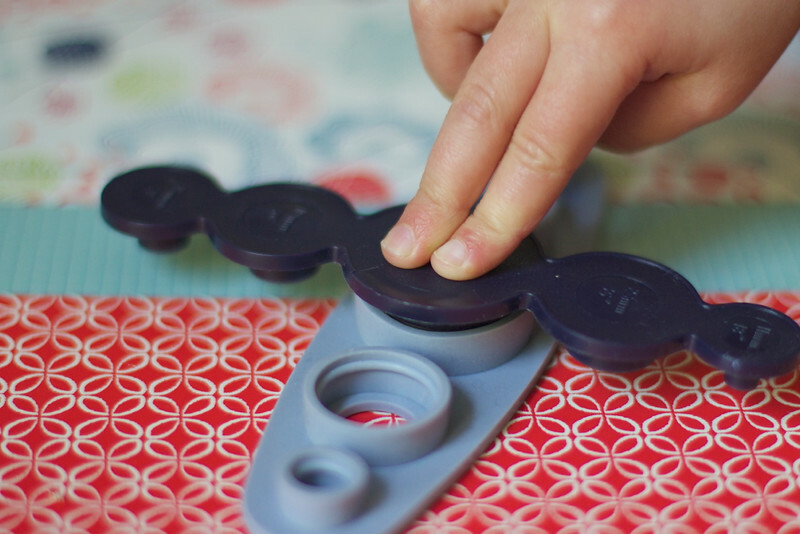 When you've finished, gently steam the elastic with your iron to set everything into place. I'm pleased with my wee buttonholes and ribbon at the front, although I practiced a bunch of times before I got the size right. 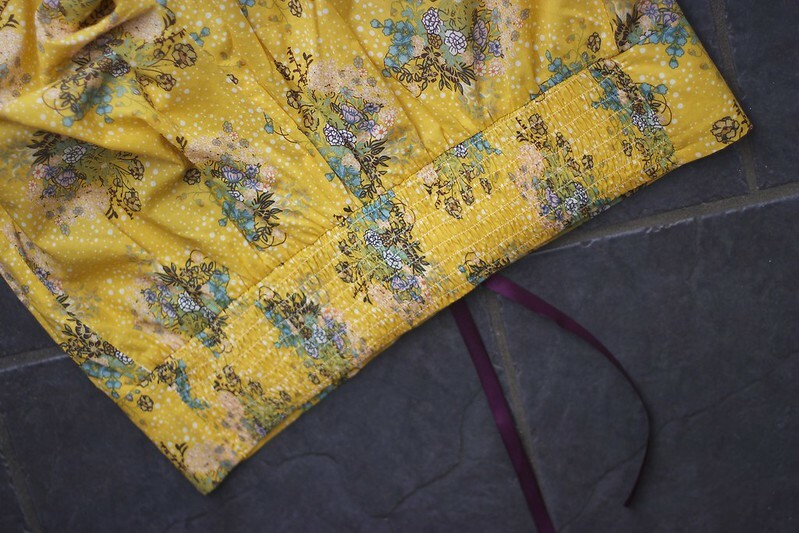 In the end I used my buttonhole foot with the tiniest of buttons and also ironed a bit of interfacing behind the fabric to stabilise it a little. That's how long it took me to make them (roughly, give or take a bit of time to clean up a little person's messes, have a coffee and talk on the phone). 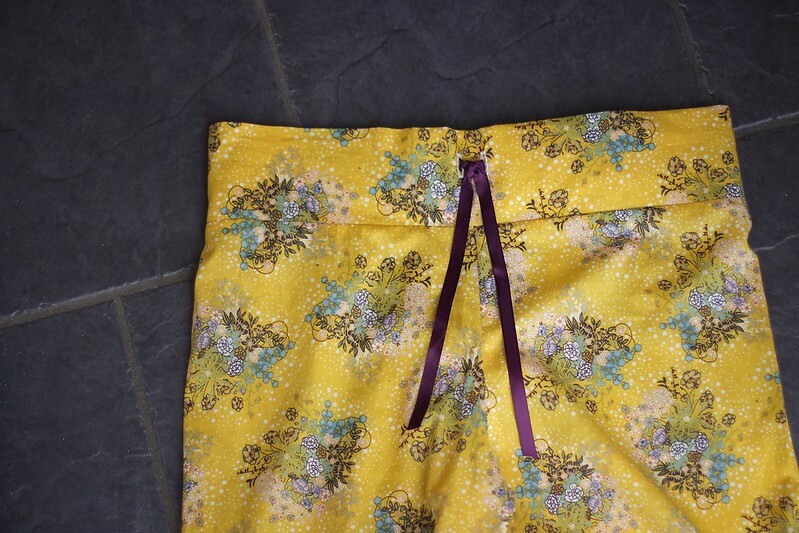 Do you think you'll make some Shirred Voile Pajama Pants? I'd like to make another pair. On the other hand, I'm never making another infograph. No way. Never again.